Immediate prayer brings a quick healing when a camper is thrown from a horse. 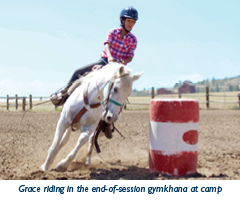 Like all of the summer camp majors at the A/U Ranches, Horsemanship pushes its riders to put their whole trust in God and overcome limitations. Grace was pushed in an unexpected way last summer. A Sky Valley camper, she had barely settled onto the back of her mount when the horse bucked, throwing her. Instantly the staff were at her side, offering powerful statements of truth and holding to the spiritual reality of man’s perfection. “We knew that everyone was praying, including her fellow campers,” says Susan Collins, the onsite practitioner who was called to pray for Grace. Susan sat down next to her on the ground and heard Grace say that she couldn’t move anything. After a time, Grace moved one of her legs, which was met with cheers. She was carefully moved on a stretcher to Highview, the nurses’ facility, and once in bed, she was given a message from her parents filled with supportive inspiration, warmth and affection. Since she had been lying in dust and horse manure following the fall, one of the staff offered to wash off her arm. Without hesitation, she lifted it up! More yelps of joy erupted. That night Grace went to dinner and slept in her own cabin. Ten days later, she participated in the camp rodeo and took first place in the barrel race for her division. The A/U Ranches, located in Buena Vista, Colorado, are a cornerstone of Adventure Unlimited’s programming. The supportive and inspiring atmosphere cultivates confidence and develops moral courage for Christian Science youth, adults and families. Activities are offered year-round, including a community outreach program, 100 Elk, which serves those of all faiths and economic diversity.